They say what goes around comes around. That happened to me, I have given away artichoke plants over the years, one of the people I gave some to was Tom for the garden at Gravetye, after so many of mine died this past winter Tom was able to give me a few plants back which I am of course very happy about. This is a reason why it is a good idea to give plants away, one day you might need some back. And as they say, never keep all your artichokes or is it eggs in one basket. I think for a gardener seeing a large amount of soil ready to be planted must be as intimidating as an artist with a large white canvas. 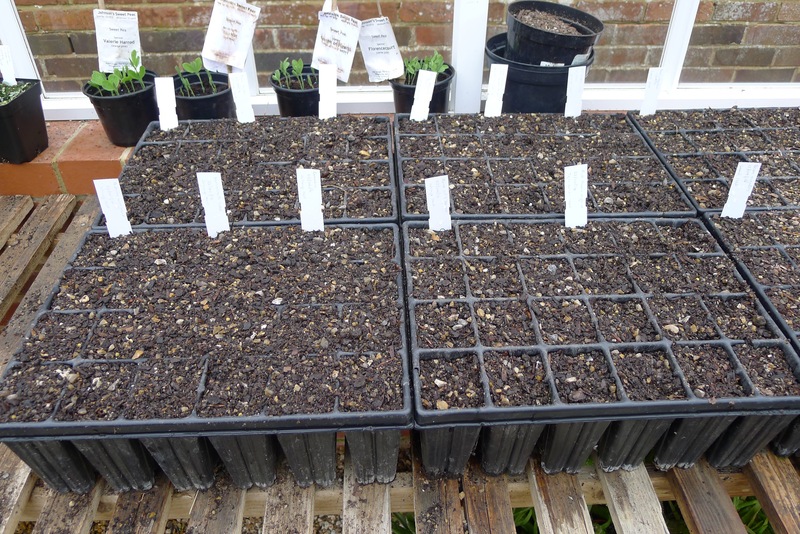 I have spent most of the day getting the soil ready to be planted. I have to say that I am feeling rather excited about it all and not sure I am going to sleep so well tonight. 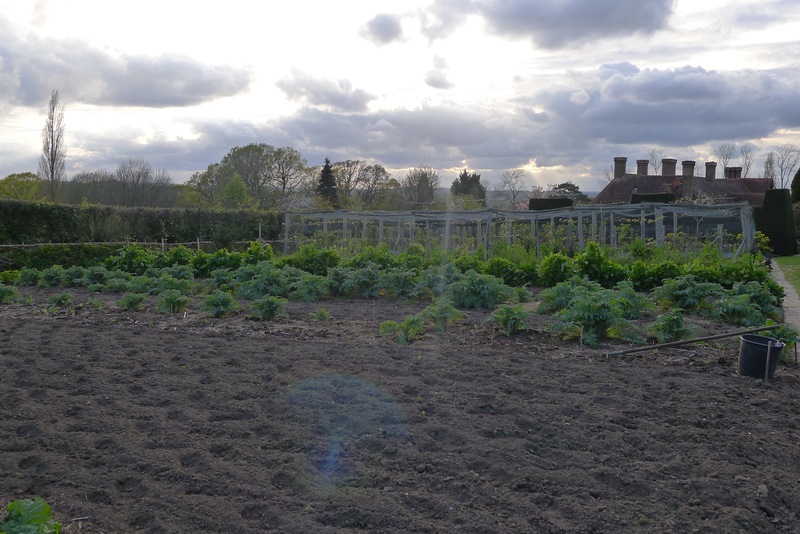 While doing the work on the soil I have worked out what is going to go where, it is not perfect but I need to get the crop of potatoes back as one so have to compromise on the area I am going to plant them in, but long-term it will be for the best. I am glad to report that the glass house mouse has moved onto another world and so my seeds may now have a chance to germinate. The sad thing is that I do not think he left any seeds before he moved on to the next life. It is not all sad death in the glass house, the beans have started to do something which I have to say has made me very happy to see. I am not going to grow sweet peas up in the garden this year but going to use the space for beans. Well I will have a few sweet peas but grown up the outside of the fruit cage. Today there was a declaration of war. The war is between a mouse and me. Last night the mouse ate a lot of my pumpkin and gourd seeds, the ones that I had sown at the end of last week. The little thing lifted the seeds from the plugs and ate them, it did not want the shell, they were left on top of the soil. To see the shells there was like a slap on the face from it to me. I have to say I am a little worried that there is not going to be a good display of pumpkins and gourds this year. Jeff, Adam and David do not book your flights yet……. It is not every day that you have lunch at a Michelin star restaurant but today I did just that. Matt, one of our students and myself went over to Gravetye Manor to have lunch with Tom and his wife Alex. The food really was just perfect, the whole setting is very special. After lunch we all needed to walk a bit and came across the head chief George out with a member of his team picking from not only the kitchen garden but also collecting from the wild. It was a great honour for me to hear what he had to say about the different flowers and leaves he had collected. You do not meet people with such passion everyday and to have Tom and George together, true joy. Thank you. Today was the day that we planted the seed of the Pumpkins and Gourds. This is a special day for me because it is a crop that I love and now brings a lot of interest to the vegetable garden when the Gourds are covering the compost heaps. It is time to make a call to three American boys to get them ready to come over and plant up for me in about six weeks. I love the idea that this crop would be planted by them as it seems to me to be such an American crop. I just hope that my Pumpkins get bigger than next-doors this year.